Our goal is to get people to step back from their wagons and look for new or different or better ideas to make improvements. Perspective is a key to choosing to do things differently. 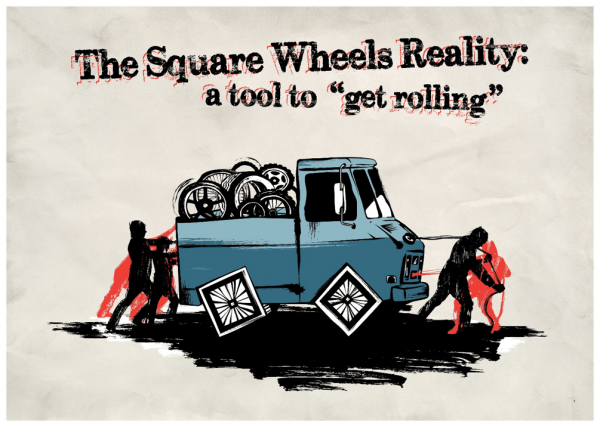 And once people identify and label something as a Square Wheel, they are driven to find the round wheel to fix it. You can also think of it as Disruptive Engagement, since it all happens at the front-line levels of an organization, away from the controlling influences of HR and senior management. Stay tuned if you want to receive a free engagement toolkit! This wagon rolled forward for a LOT of years and lots of miles, with me presenting sessions in almost 40 countries and initially selling transparency-based books and then powerpoint illustrations as toolkits for change, motivation, etc. 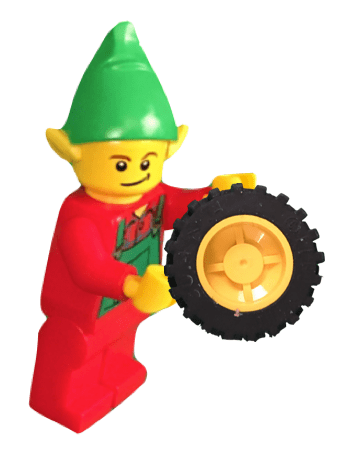 It got me to be known as, The Square Wheels Guy. 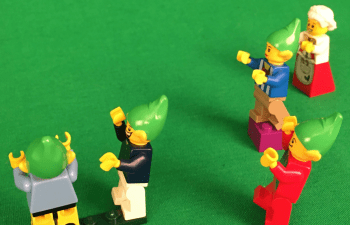 But more recently, things happened and we started shifting over to using LEGO® blocks and Technics people to represent the themes and ideas, creating various scenes and frameworks that continues today and have moved into our other product designs and toolkits that continue to evolve. And we think this is a big improvement. The goal of showing the image is to generate active involvement and diverse thinking about how things work and what things might be done differently. The key points are quite obvious and people project their thoughts about their workplaces onto the visual. These conversations around what it might represent as an organizational reality tend to focus on people, engagement, active involvement, innovation, leadership, motivation and similar. They are about issues, opportunities and implementation. They are about innovation and best practices and collaborative dis-un-engagement. And we package a number of very simple toolkits as well as an online course so that supervisors and team leaders can learn facilitation skills. 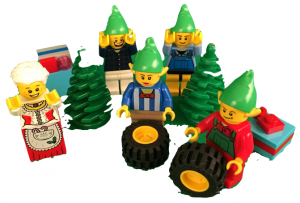 We have also used the LEGO scenes to create some stop-motion videos, which are easy to do and which would be much harder with line art. This is NOT rocket science, to show an image and generate a discussion. It is a powerful but elegantly simple tool to generate real discussions about perceived workplace issues. 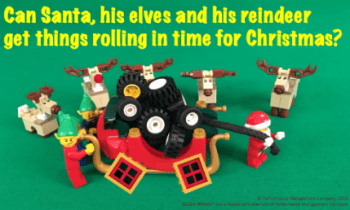 In our efforts to broaden exposure, we engaged with an organization to sell an Icebreaker toolkit around this theme to their customer base, which is different than mine but very congruent. It is a framework for collaboration and co-marketing that seems to have no downside. So, I am faced with a marketing decision with a variety of factors. Does the above image represent an improvement or is it simply a dilution of my intellectual property? Is the image itself going to generate better discussions about organizational reality and issues and opportunities, since it IS a very different scenario and has different features. Is the last image going to get the positive reactions from discussion participants like the first two does? If you were to change the latter image, how would you change it to improve its effect in generating engagement and ideas? Which image do you personally prefer and why? © Performance Management Company, 1993 – 2017. All Rights Reserved. 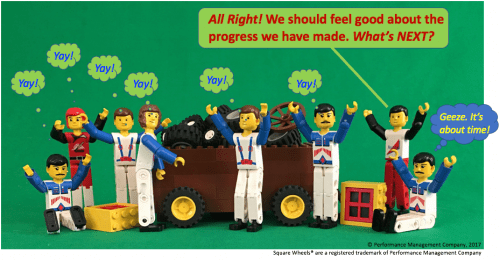 Please Note: The offer of a free Square Wheels Toolkit is limited to the first twenty (20) people who share a relevant and useful comment about the image dilemma and its resolution. 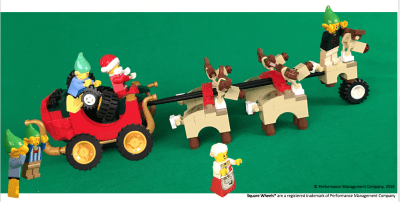 So, I started responding and realized it would make a good blog, since the focus is on helping managers impact organizational performance, and keeping things simple and straightforward. All of my products are designed so that managers can deliver them without any support from Training or HR. That simply makes sense, given how isolated those departments can be from organizational reality. 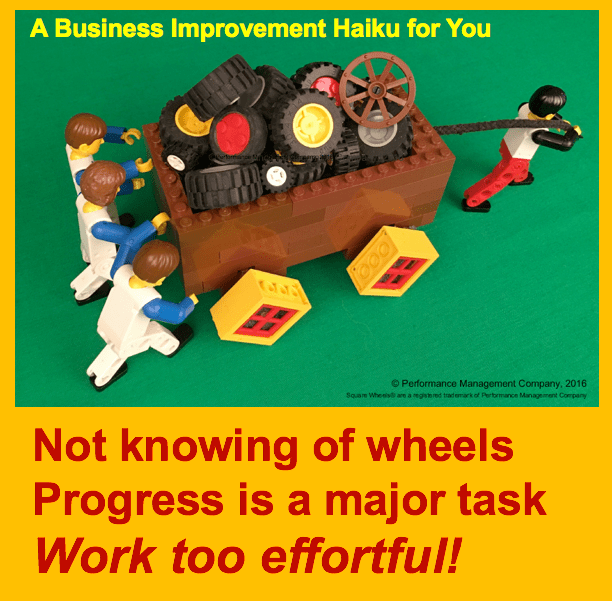 They are simply too busy doing other things of a higher priority to directly help managers. Managers NEED tools to help them improve active involvement and clarify organizational alignment and deal with issues of people and performance. Simple straightforward packages that do not require heavy train the trainer or psychological principles are much more useful than the complicated models that we often use in consulting or training. Simple tools to address real problems in straightforward ways are simply better, if they can be made available. Tools to involve and engage workers for process improvement and innovation or to help actively involve and engage them in productivity increases are practical, and those that build teamwork and collaboration are even more important over the long run. Managers need to be better motivators and workers need to be more innovative and productive and motivated. But managers and supervisors are often incredibly over-burdened with other responsibilities and priorities that it makes their interpersonal communications very hard to accomplish. One survey said that managers have more contact with their remote workers than they do with the people who share office space with them. What I have been writing about lately is the theme of Disruptive Engagement, with the premise that ideas coming from the bottoms up are so much more likely to actually occur than things driven from the tops down. You can read more about that in my other posts on leadership and innovation. And managers have to be more actively engaged in their workplaces and with their people. To illustrate, Gallup found that managers working for engaged leaders are 39% more likely to be themselves engaged and that employees working for engaged managers are 59% more likely to be engaged, something they referred to as The Cascade Effect. Of course this makes logical sense but the numbers are pretty startling if you consider the flip-side and the issues around working for UN-engaged leaders and managers. Gallup also reports that 51% of managers are not engaged and that 14% are actively disengaged. Scary. 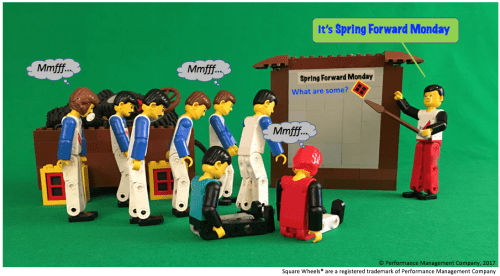 With The Square Wheels Project, we offer an online training program that any supervisor can take to improve their group facilitation and team building skills and they also get a Square Wheels Toolkit of powerpoints and worksheet handouts to capture ideas and generate considered alternatives for improvement. 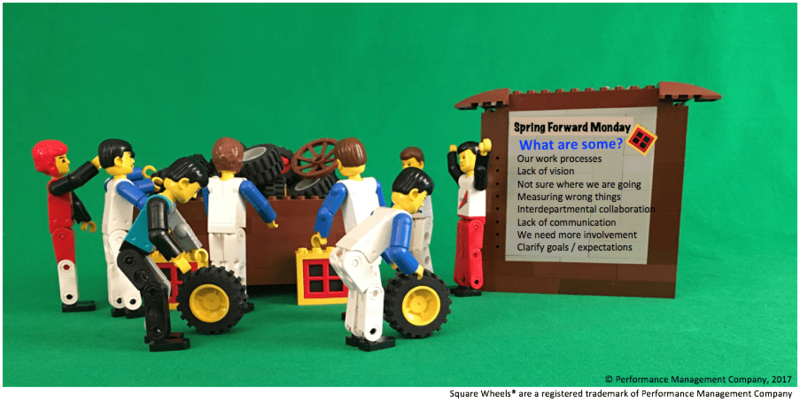 With the Stupidly Simple Square Wheels Toolkit, we offer a complete and easy to understand powerpoint-based training program, basically the materials supported by The Square Wheels Project but without the online training videos and other supporting modeling of delivery ideas. The idea is to hold workplace meetings focused on identifying things that do not work smoothly for people and then identifying possibilities for improvement. I mean, what worker, where, does not have ideas to make things work more better faster? But nobody listens to them and few bosses seem to care, so those ideas simply languish. 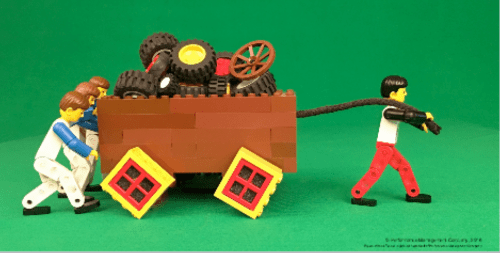 The beauty of Square Wheels is the generality of the metaphor – things thump and bump but Round Wheels are already in the wagon. Don’t Just DO Something, Stand There! Idealistic? NO. There are thousands of examples of this kind of impact, person to person. While there is no silver bullet since organizational cultures and issues around trust and leadership vary so widely, the reality is that Ask and Ye Shall Receive actually works quite well when one involves and engages teams of people in the improvement of their own work environment. Lastly, we need to upskill the workers and managers on their issues of Dis-UN-empowerment and Dis-UN-Engagement, which is otherwise called Roadblock Management. People need the tools to mentally manage the issues that appear when any kind of change process is happening and having peer support for improvement is a valuable factor. 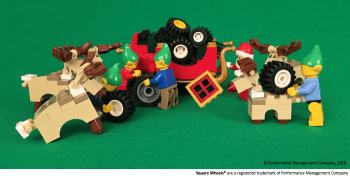 We have a simple toolkit and model for Roadblock Management, too! As I said earlier, we do not believe that all this stuff is rocket science. There is an elegant simplicity in our approach, one that negates a lot of the apparent complexity that often prevents people from moving forward. Our tools are all about rolling forward more better faster. My understanding, based on a doctorate in behavioral neurophysiology and early consulting work with people like Ed Feeney and Tom Gilbert and Ken Junkins drove me to believe that performance feedback is the breakfast of champions and that active involvement and ownership is what drives real motivation. 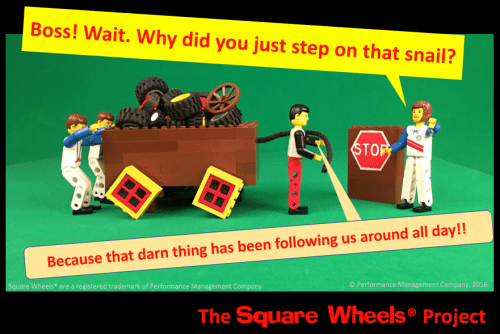 Using Square Wheels® to create a perceptual gap between how things are and how they could be (Round Wheels) is simple cognitive dissonance. 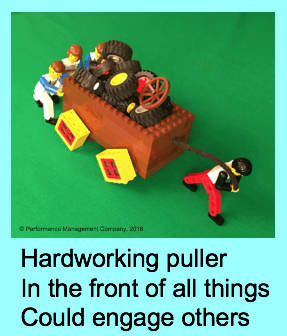 One of the best team building exercises in the world, as rated by his users, is The Search for The Lost Dutchman’s Gold Mine, which focuses on leadership, collaboration, alignment and focuses on implementing the collective performance optimization ideas.